Who doesn't love a good pie? This one has a lot going on, but it totally works. 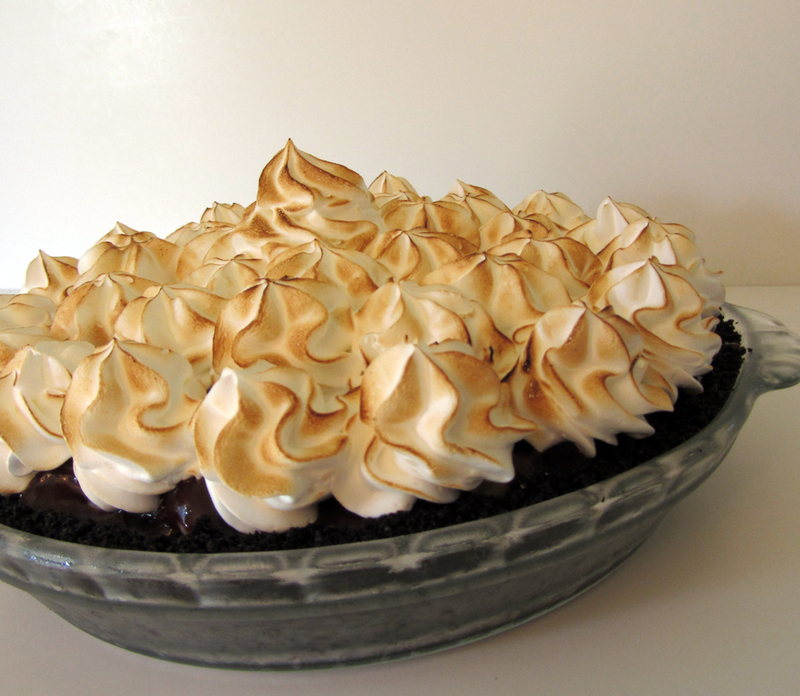 Picture a cream pie, a banana pudding, and a sundae all colliding; sliding down into a chocolate cookie crust, and being buried in toasty meringue. I got the idea for this pie when I saw a recipe for Banana Fudge Pudding in a Jar at Confessions of a Cookbook Queen. My husband loves a good cream pie and I thought perhaps I'd surprise him with one. I adapted the crust and pudding from Cooks Illustrated recipes. The meringue is Wilton's. Bananas are finicky fruits. As with any banana pie, the longer you keep it, the more degradation of the bananas (softening, eventually weeping). This pie is best served the day you make it. It would be a great idea, though, to make the crust and fudge sauce the day before. This recipe has quite a few steps. You can significantly reduce your time in the kitchen by using instant pie filling and jarred hot fudge sauce. It'll still be great and no one will ever know! Shhh! 1. For the Crust: preheat the oven to 350°. 2. Break each cookie into a few pieces and place them in the bowl of a food processor. Pulse until the cookie crumbs are uniformly fine. Add the butter to the bowl and pulse until thoroughly incorporated. 3. Pour the cookie mixture into a deep pie dish. Press the crust firmly and evenly into the bottom and up the sides of dish. Place in the freezer for 5-10 minutes to firm up the crust. 4. Bake the crust for 10 minutes. Remove from the oven and allow to cool completely. 5. Meanwhile for the Pudding: Premeasure the milk and evaporated milk. Set aside. Place the butter in a medium bowl. Set a fine mesh strainer over the bowl. Set aside. 6. In a large saucepan, whisk together the sugar, cornstarch, and salt. Whisk in the eggs followed immediately by the milk mixture. Whisk until smooth. 7. Set the pan over medium heat. Cook, whisking often at first and then constantly as the mixture thickens, until it begins to simmer. Simmer for one minute and then remove the the pan from the heat. 8. Pour the pudding mixture through the strainer, into the prepared bowl. Add the extracts. Whisk until smooth. 9. Place a sheet of plastic wrap directly over the surface of the pudding (to prevent a skin from forming). Cool completely. 10. For the Fudge Sauce: combine the brown sugar, chocolate, cream, corn syrup, and butter in a medium saucepan. Set over medium-high heat. Bring the mixture to a boil. Reduce the heat to medium. Cook, stirring, for 2 minutes. 11. Remove the pan from the heat. Stir in the vanilla. Pour the mixture into a bowl. Cool completely, stirring occasionally. Stir vigorously to finish the sauce. 12. Assembly: pour the fudge sauce into a medium or large Ziplock bag. Seal and then snip the corner. Squirt half of the fudge into the bottom of the pie crust. Use an offset spatula to carefully smooth the sauce into an even layer. 13. Carefully spread about half of the pudding evenly onto the fudge sauce. 14. Tile the Nilla Wafers in a single layer over the pudding. Spread the remaining half of pudding over the wafers. 15. Tile the banana slices in a single layer evenly over the pudding. 16. Squirt the remaining fudge sauce over the bananas. Use an offset spatula to gently smooth the sauce, creating an even layer with no gaps. Chill for 3 hours or until completely cold. The pie is perfect right now and can be served as-is or with whipped cream. To top with meringue (which is best done soon before service), continue on to the next step. 17. Place the meringue powder, 7 tbsp of the sugar, and the water into the bowl of a stand mixer. Beat until soft peaks form. Begin slowly adding the remaining sugar. Beat until stiff and dry-looking. 18. Spread or pipe the meringue onto the pie. Use a kitchen torch (or a very hot broiler if you don't have a torch) to brown the meringue. 19. Slice and serve! To store, cover and chill.